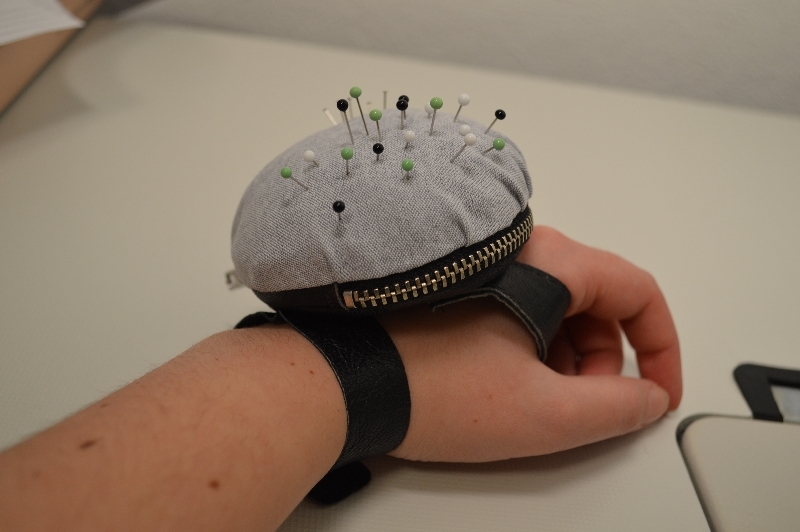 I’m proud to present my latest invention – the washable hand pincushion with a leather base! Before I present all the lovely ideas behind this pincushion I feel it’s only appropriate to talk about the first version before I give it a proper burial in the trash bin. 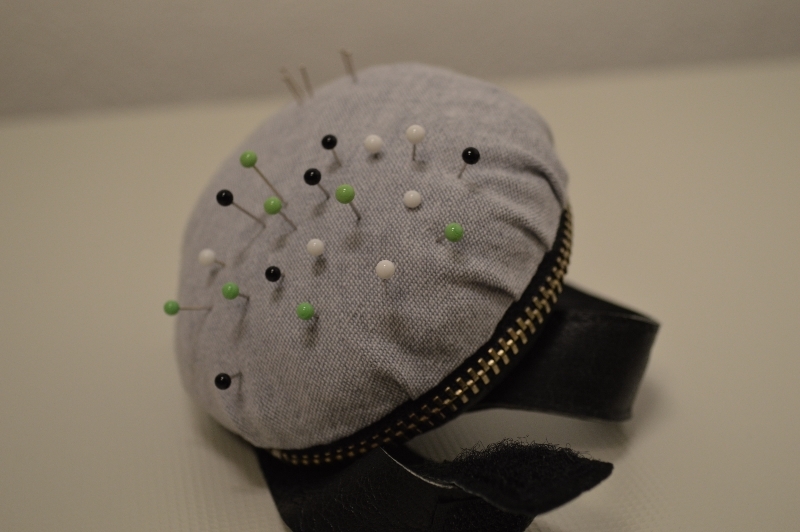 When I started sewing clothes more seriously a couple of years ago, it didn’t take long before I realized I needed a pincushion that I could wear on my hand. Just sticking the pincushion on the wrist would’ve worked but it wasn’t good enough. I wanted the cushion to be closer to my (right) working hand to minimize the distance my hand needed to travel to pick up a pin. Surely that should speed things up a bit. 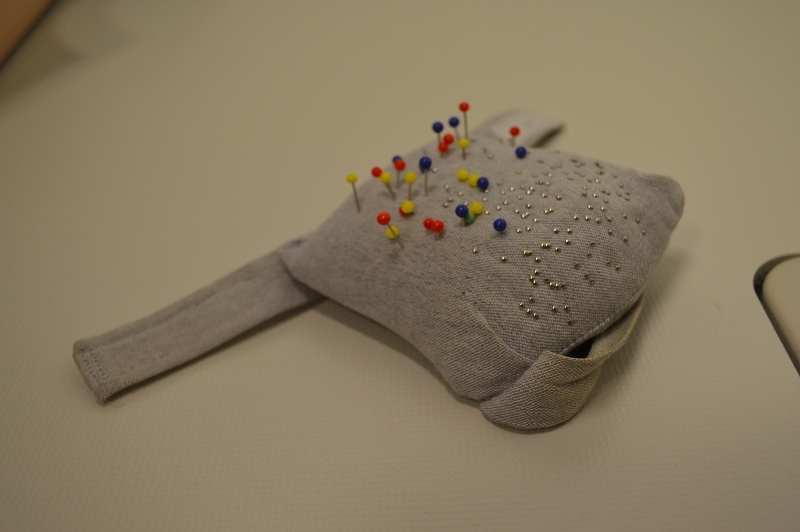 That was when I came up with the first prototype of the hand pincushion. R.I.P. my faithful old pincushion. I cut out a piece of cardboard paper the size of my hand as a base (we wouldn’t want the pin to go through and hit the hand, now would we). Some leftover fabric from my grey shirt was turned into a casing. Two straps were added, one fixed size and one with sewed on velcro. Then all it needed was some stuffing and a seam to close the whole thing up. It has served me well for years but it didn’t take long for it to get dirty (unfortunately ladies got hand sweat as well). Only problem was that cardboard paper doesn’t do well with water… Clearly I needed something that could handle washing up. For the first requirement, I decided that some medium thick leather should do the trick. It would be thick enough for the pins not to go through but still flexible enough to follow the hand. Of course, leather also gets dirty but it doesn’t “soak” it up the same way fabric does. This means it shouldn’t need washing that often. No cardboard paper means that it’s washable but do we really need to wash everything? I think not! 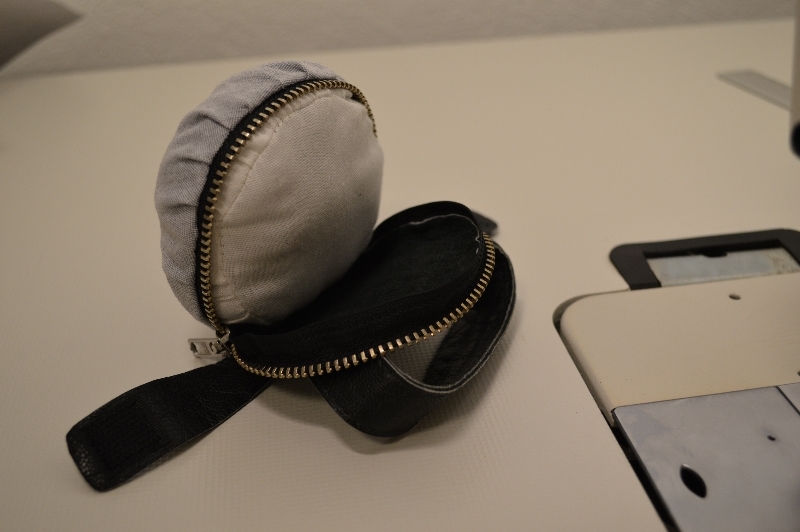 That’s why I’ve added a removable inner cushion and of course a zipper to enable the removal. When closed, the slider of the zipper is facing out, away from the wearer so that it’s not in the way. Peek-a-boo! There’s the hidden inner cushion. As for fabric choices, I went with a very thin fabric for the inner cushion. You barely feel any resistance as you pierce it with a pin! Since I was so pleased with the grey fabric, I decided to continue using it for the outside fabric. 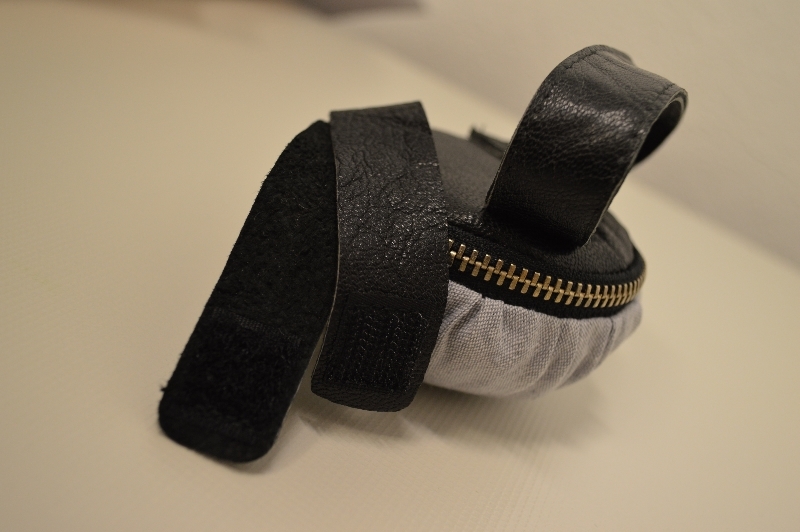 I also liked the velcro fastening on the first version so I decided to keep that as well. Categories: Misc | Tags: hand pincushion, pincushion, sewing | Permalink. I should make something like this! I am always displacing my pincushion.